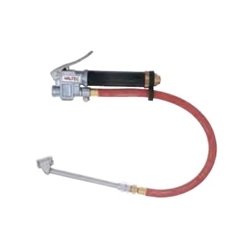 Inflating Gauge Dual Foot Air Chuck 12" Hose Haltec I-406M / BOWES HT I-406M. Has 12" of hose and CH-335 dual foot air chuck to service small diameter wheels. Gauge is calibrated 10-120 psi in 2lb increments.